Standard air cleaners have filters that are very dense, so they stop the dust by trapping it in a slightly porous filter. The fewer the pores, the more dust it can trap. However, this not only stops the dust and dirt, but it also stops the air from moving as well. So, you may not be as comfortable, and less air is cleaned efficiently. This is called pressure drop. Our air cleaners have the lowest pressure drop with the highest efficiency possible. Particles like dust, smoke and bacteria are often .3 microns or less. At that size, allergens can get deep into your lungs because they aren’t filtered well by your nose and throat. An effective air cleaner can reduce the presence of potential asthma and allergy attack triggers in your home, like dust, pollen, pet hair and dander, dust mites, mildew, lint, fungus, most tobacco smoke, cooking grease, and even bacteria. Our Air Cleaners utilize patented, breakthrough air cleaning technology to remove up to an astounding 99.98% of airborne allergens from the air that passes through the filter. 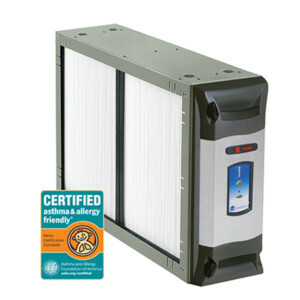 It catches particles as small as .1 micron, making it 8 times more effective than even the best HEPA room filters and up to 100 times more effective than a standard 1-inch filter. Temperature is just one factor in total home comfort, especially in dry weather. A whole-home humidifier provides the right amount of moisture in every room, and can help alleviate allergy symptoms. Homes up to 4,200 sq. 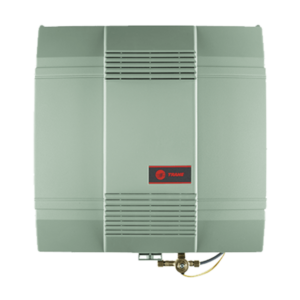 ft.
Our trusted humidifiers can adjust from summer to winter to provide the right amount of moisture to the air in your home. It’s not just comfort. It’s relief for your skin. Having a dry home can be damaging to valuable things such as furniture, paintings and woodwork. By adding a humidifier to your home’s heating and cooling system, you can help ensure it won’t dry and crack. A humidifier will not only alleviate the dryness but also give you the most advanced whole-house air filtration system. So you get clean, comfortable air that feels good all year long.